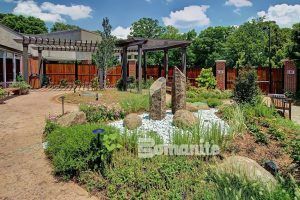 What used to be a concrete jungle adjacent to the emergency room waiting area at Carolina Medical Center-Mercy in Charlotte, NC, is now a beautiful 4,000 square foot garden where loved ones and hospital staff can relax and heal. The Dr. Sanford and Lois Benjamin Healing Garden is a welcome oasis enhanced and architecturally engineered using Bomanite Imprint Systems with Bomanite Bomacron decorative concrete and installed by licensee Carolina Bomanite. Bloc Design, also of Charlotte, NC, turned the space into a tranquil garden designed with intentional and specific elements that aid in therapeutic benefits to all cognitive aspects of a person including emotional, physical, and spiritual. The serene area has a courtyard, sitting areas, walkways and plenty of landscaping. The Bomanite Bomacron concrete has multiple textures, colors, and patterns including Bomacron Regular Slate and Bomacron Small Sandstone. 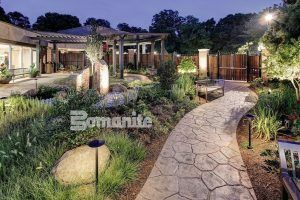 Carolina Bomanite worked carefully with the Landscape Architect in the use of pebbles and stones strategically placed and incorporated into the walkways to provide a tranquil, but easy to navigate setting. The garden provides restorative opportunities to patients, visitors, and staff. 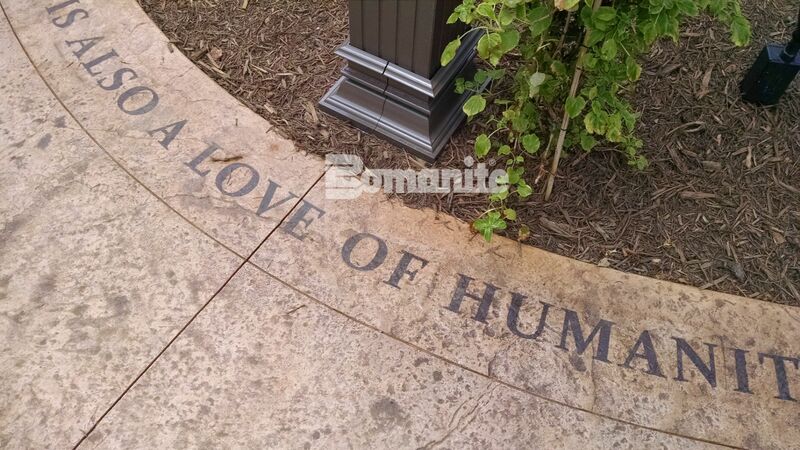 The text in the decorative concrete was “etched” into the concrete and Bomanite Con-Color was used to highlight them. During construction, the location and access to this small area directly outside of a busy hospital emergency entrance created a difficult work environment for the crew. Most days their trucks had to park two blocks away in a small back lot behind the hospital. 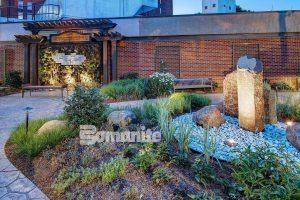 From seemingly chaotic challenges of the construction site emerged a truly beautiful healing garden that features gorgeous decorative concrete for this busy uptown hospital. Bomanite Bomacron concrete is not only pleasing to the eye, it obviously also helps in the healing of body and spirit. 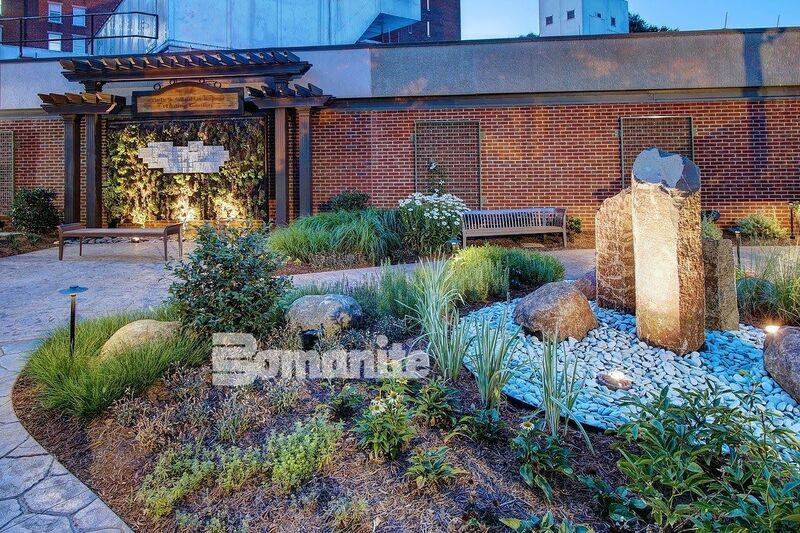 Please also see CMC Mercy Hospital Designs Serene Healing Garden with Bomanite Imprint Systems.